Digital Audio CD-Rs are for use with Consumer Audio CD recorders such as Philips CD Recorders Marantz CD700 and Pioneer PD-R04 PD-R05 PD-R555RW and PD-R99 which require special Digital Audio CD-Rs. 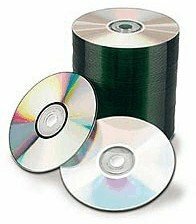 Consumer Audio CD recorders cannot record on standard CD-R media.Digital Audio CD-Rs meet the standards of the Audio Home Recording Act (AHRA) of 1992 which requires a royalty to be paid by the disc manufacturer to the music industry. These CD-R's support the Serial Copy Management System. Note: Purchase of a sample is highly recommended. If you have any questions about this product by SpinX, contact us by completing and submitting the form below. If you are looking for a specif part number, please include it with your message.